Nashoba captain Nate Mansour’s (No. 11) defense helped the Chieftains prevail against the previously unbeaten Pioneers of St. John’s High School. BOLTON, Mass.- The Nashoba Chieftains charged past the previously unbeaten St. John’s (Shrewsbury) Pioneers, 61-55 on Friday night at Nashoba Regional High School. 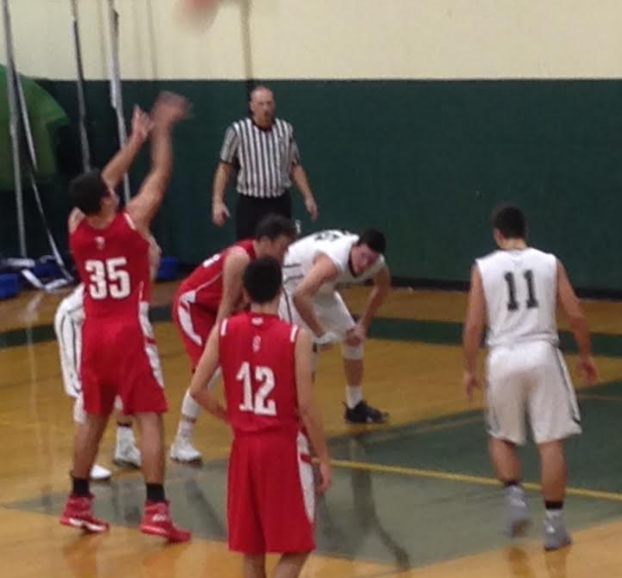 With the win, Nashoba (1-0) hands St. John’s (3-1) just its third loss in its last 29 games played. Playing in front of a passionate, near-capacity crowd, the Chieftains wasted no time in grabbing a lead. Captain Justin Peirce, who led all scorers with 21 points to go along with three steals, scored on a driving layup on the first possession of the contest. Baskets by Trevor Manyak and sophomore center Connor Ojerholm (6 points, 4 rebounds) gave Nashoba six points before a St. John’s shot found the net. Following a Pioneer timeout, St. John’s scored eight of the next ten points, tying the game at 8 apiece with 3:25 remaining in the first quarter. After a 3-pointer by Peirce with 1:21 remaining in the opening period, a bucket by St. John’s guard Tyler Mola (16 points) put the Pioneers up by one as the first quarter ended. St. John’s forward Cole Stairs, who led the Pioneers with 17 points and 8 rebounds, started the scoring in the second quarter, allowing St. John’s to open up a 16-13 lead. Nashoba responded with a 10-2 run, with 6 of Nashoba’s points coming from Peirce during that span. After a pair of free throws from Peirce opened up a 27-20 Chieftain lead, St. John’s closed the quarter with a 7-2 run of their own. The Chieftains clung to a 29-27 lead after 16 minutes of play. The two teams exchanged baskets in the first half of the third quarter, and the score was knotted at 35 apiece with 4:02 remaining in the third period. A basket by Nashoba senior Andrew Fish gave the Chieftains a 37-35 lead that they would not relinquish. As time wound down in the third quarter, Nashoba turned up the pressure on the Pioneers. Feeding off the energy of the crowd, the Chieftains played aggressively on both sides of the ball. With senior captain Nate Mansour (6 points, 3 rebounds, 2 steals) leading the Chieftain charge on defense, Nashoba forced eight Pioneer turnovers. Chieftain coach Danny Ortiz was very pleased with Mansour’s dominant defense. After a three-pointer by Peirce, St. John’s forward Sean Burke (12 points, 4 boards) hit a free throw to cut the Pioneer deficit to 42-38 at the end of the third quarter. The fourth quarter turned into a three-point fest for both teams. Twenty-one of the thirty-six points scored in the fourth quarter came on three-pointers. Alex Bradley (5 points, 3 steals) began the three-point party, trimming the Chieftain lead to 42-41. The final three-pointer of the night was made, fittingly, by Peirce. Peirce’s shot was taken from well behind the three-point line, and it gave the Chieftains a 59-50 lead with 1:45 remaining in the fourth quarter. The Pioneers could not come close to pulling off a miracle victory at the end, as the Chieftains celebrated a statement win in their season opener. Coach Ortiz was very proud of the way that his entire team played. Nashoba looked very sharp against St. John’s, especially given that this game was Nashoba’s season opener. The Chieftains always seemed to be a step ahead of the Pioneers, and every time St. John’s launched a comeback, the Chieftains responded. Nashoba played well from the opening tip until the final buzzer, and earned a hard-fought, team win against a team that went to the Division 1 state final last season. Nashoba should go into their game in Fitchburg on Tuesday brimming with confidence. For St. John’s, this was their fourth game in the last eight days. They kept fighting until the horn sounded. St. John’s has five players who are 6’4 or taller, and their depth down low could pay dividends later in the season. Their schedule does not become any easier, as the Pioneers will host a formidable Marlborough Panthers squad next Friday night.